The brainchild of Wilfrid Capper MBE who in 1946 had the inspiration to create a circular walking route taking in the six counties of Northern Ireland, the Ulster Way is a must for any long distance walker looking for their next challenge. The long-distance route, through some of the best landscapes Northern Ireland has to offer is definitely a challenge of a lifetime. With this in mind we chatted to a number of people who have completed the route both in part and full to get an insight into their experiences and find out some top tips for anyone wanting to complete the route themselves. Find out the difference between a quality and link section here. How long will it take me to walk the Ulster Way? There is no way of giving one estimated time of how long it would take to walk the entire Ulster Way as this is dependent on a number of factors including your ability and speed and what arrangements you make regarding the link sections. (We recommend that you follow the advice on our website: walk the quality sections and make use of the public transport on the link sections). Other factors include the weather, and whether or not you plan to walk the route in one go or take it in sections. Depending on your fitness level it is anticipated that it would take on average 3 weeks (based on an average of 20 miles walked per day) to walk all of the Quality Sections. Wilfrid the founder amazingly, at the age of 88, hiked the entire original 665 mile route in just 32 days. Two teenagers completed the entire Ulster Way (both quality and link sections) in 2010 to raise money for Headway Northern Ireland. It took them 5 weeks and 1 day. 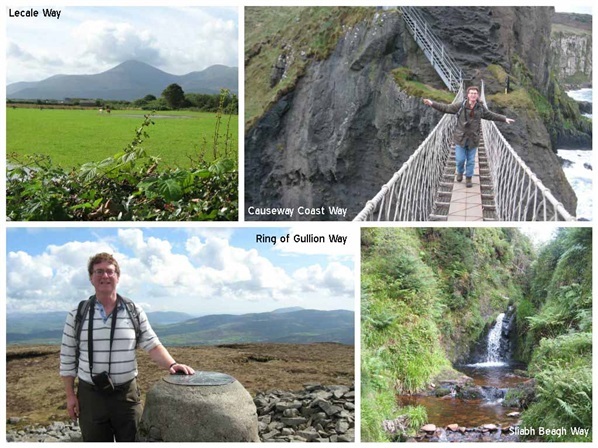 Claire Ferry on her journey around RSPB nature reserves completed many sections of the Ulster Way on her trip round Northern Ireland which took her 5 weeks. Others have taken anywhere between 18 months and 6 years to complete the entire route taking it in sections. What Should I Plan Beforehand? Although the quality sections are waymarked, unfortunately circumstances beyond our control e.g. theft can occur and therefore it is important to always be prepared and bring a map and compass when walking the route. You can also download route descriptions and printable maps on the Ulster Way website. 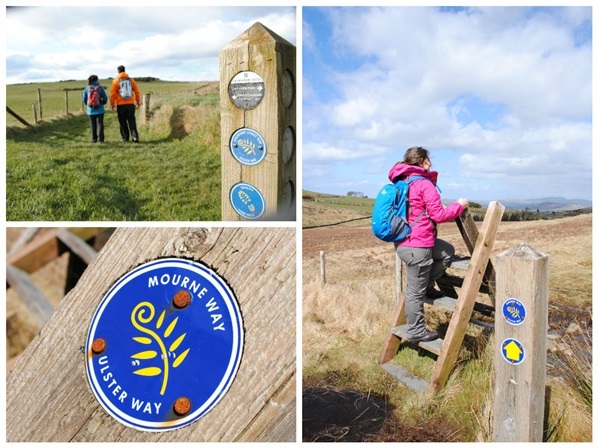 6 of the quality sections (Causeway Coast Way / Lecale Way / Mourne Way / Moyle Way / Ring of Gullion Way / Sliabh Beagh Way) also have their own downloadable guides which may be useful when planning your route. It is a good idea to plan where you will stop each day so you can arrange appropriate transport and accommodation. Many of those who we spoke to checked public transport times and had a list of taxi numbers on hand so that they could book these in advance (a list of local taxi numbers can be found in each of the way marked way guides mentioned above). For those walking the route in sections a popular option was to drive to the start then get a taxi back to the car. Visit the getting around section on the Ulster Way website for details of the very useful Rambler Bus Service and Translink Journey Planner. There are a range of accommodation options available along the route from B&Bs and guesthouses to self catering accommodation and hotels. Details of accommodation situated near or on the route can be found on the relevant sections on the Ulster Way Website. You can also check out WalkNI.com for exclusive accommodation offers for walkers. As with any long distance walk the key is to keep it light! Many of the people we spoke to carried everything they needed on their back including waterproof jacket and trousers (essentials no matter what time of year in Northern Ireland! ), a complete change of clothing, first aid kit, map, compass, directions, food and water. The beauty of the Ulster Way is that it does pass through a number of towns and villages so there is plenty of opportunity to stock up on supplies however some sections are very rural so again good preparation is key! The route is long, and not always on paths so sections can be quite muddy and over uneven terrain therefore a good pair of walking boots are essential. 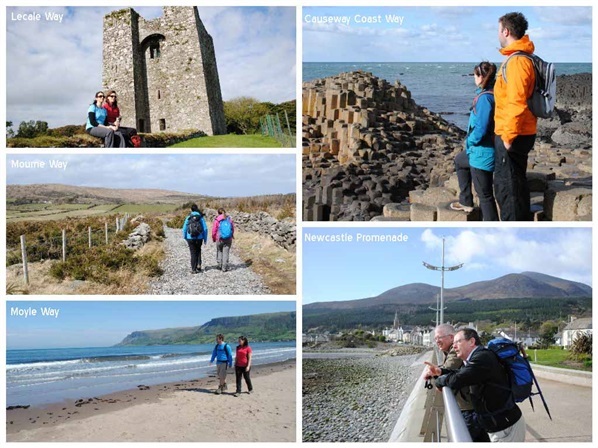 Hikers Blog, run by a group of Irish hiking and camping enthusiasts, features a few good articles of first hand accounts of the Mourne Way, Newcastle Way, Sliabh Beagh Way and Lecale Way. In 2009 Ulster Walker completed the Ulster Way. 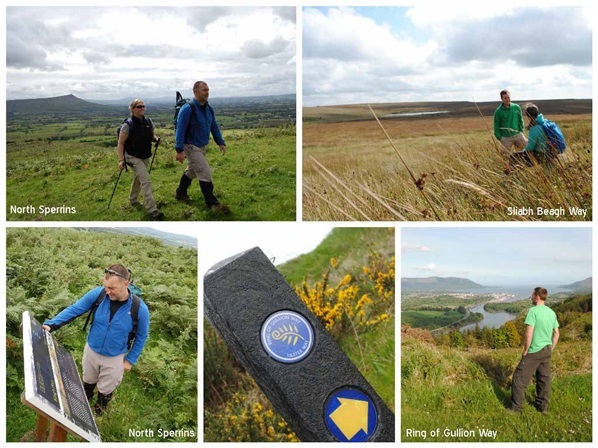 Although he completed the old version of the Ulster way (the route was updated in 2009) many parts are still the same and you can view some fantastic pictures from his walk here and read about his journey on his blog. If you decide to walk the Ulster Way make sure to tell us about your favourite bits and send through any images from your trip to ulsterway@walkni.com we'd love to see them! The people of Northern Ireland, cycling fans and non cycling fans, really stepped up to the mark in supporting the Giro d’Italia when it came to visit our shores at the start of this month. Hopefully this race, the second largest cycle race in the world, will have rubbed off on a few folk encouraging them to either dust down their bikes or make a trip to a local bike shop. If you are one of them, below are some routes along the Causeway Coast, an area used for the second day of the race, plus suggested pit stops along the way to truly whet your appetite! 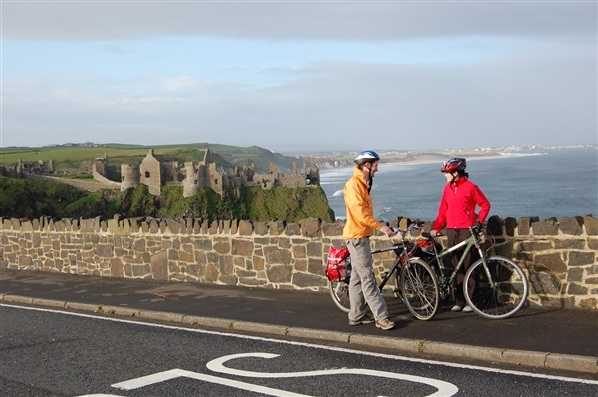 If you want to experience the scenery and soak up the atmosphere of the Causeway Coast with your family by bike this short cycle route is ideal. The route connects Castlerock village with Downhill Forest and predominantly follows traffic-free sections of National Cycle Network. Enjoy stunning coastal scenery and magnificent views towards Donegal, as well as viewing two of the tallest Sitka Spruce trees in Ireland, known by some locals as ‘Laurel & Hardy’. Once arriving back in Castlerock via the same route, Crusoes Coffee Shop offer great coffee and freshly prepared food. They also have a children’s area, complete with jigsaws books and drawing paper to keep the kids entertained. For those that really want to experience the freedom of cycling on the road and clock up some miles here are some fantastic routes well worth giving a go! This circular route links the coastal resort town of Ballycastle to the Giant's Causeway using the spectacular Causeway Coastal Route returning via Bushmills and the country roads of North Antrim, which are signed as part of the National Cycle Network 93. If you’re feeling the need to reenergise, a great coffee stop at around the half way point is in Bushmills at the Copper Kettle where you will always be welcomed with a friendly smile. 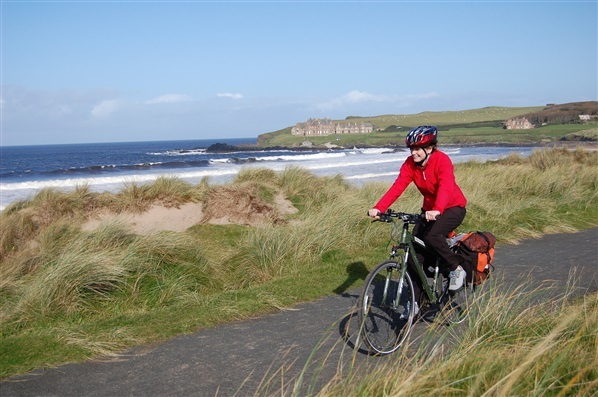 For a stunning cycle ride along the North Coast, follow NCN Route 93 between the Giant’s Causeway in the east and Benone in the west, passing through the resort towns of Portrush, Portstewart and Castlerock. Significant stretches of the route are along traffic-free paths. At Downhill follow the main Coast Road to Ballymaclary House Tea Rooms, a family run tea room offering light lunches, snacks, and afternoon tea with a range of home baked delights and with a total of 42 miles in the legs once you’ve returned to the Giant’s Causeway via the same route there’ll be no need to feel guilty about indulging in a bun or two. From Bushmills, follow the spectacular Causeway Coastal Route, passing the Giant’s Causeway to the coastal resort town of Ballycastle. From Ballycastle follow Section 9 of the ‘Ballyshannon to Larne’ cycle route to Cushendall, where a well earned bite to eat can be enjoyed at Upstairs at Joe’s Restaurant and Bar. On the return leg of the journey from Cushendall head back towards Ballycastle via the A2 for a taste of different scenery amongst the Glens of Antrim. Once in Ballycastle follow the Staid Road back to Bushmills. 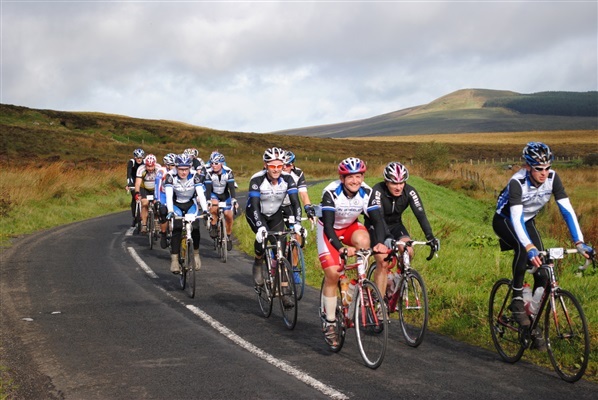 This circular route follows one of the official routes of the Giant’s Causeway Coast Sportive, a road cycling non competitive event held every September. If you want to be amazed with the breathtaking rugged coastline and the romantic landscape of the glens then this is the cycle for you. This route can be broken up in a number of different ways but we have suggested on Day 1 you start in Glenarm, cycle the Coast Road to Ballycastle (30miles) and stay in the Marine Hotel, situated on the sea front in Ballycastle, that evening. 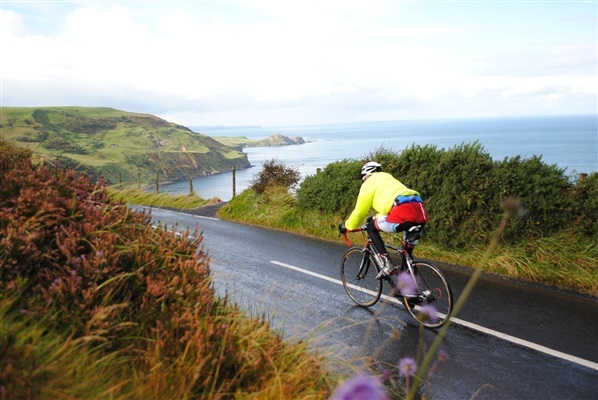 Day 2 is a longer journey as you make your way through the Glens of Antrim, finishing in Glenarm (49 miles). To celebrate the Giro d'Italia coming to Northern Ireland, a local Bike Tour Company Belfast City Bike Tours, have put together a 2 day self guided tour of Stage 2 of the Giro d’Italia race route with an overnight bed and breakfast stop at Cushendall. On the morning of the cycle you pick up your bikes in Belfast and travel by train to join the official Giro Stage 2 Race Route at Ballymoney. You then cycle to the spectacular Causeway Coast passing close to Dunluce Castle, the World Heritage site at the Giant’s Causeway, the Game of Thrones film setting at Ballintoy Harbour, the daring Carrick-a-Rede Rope Bridge and the majestic Fair Head before returning to Belfast through the stunning Glens of Antrim and past the historic castle at Carrickfergus. The tour involves around 45 miles of cycling on both days which can be shortened or extended to suit you. The tour costs £95pp which includes bike rental, mechanical back-up, route maps and bed and breakfast accommodation. The tour providers can also provide panniers or transport your luggage for an additional cost. 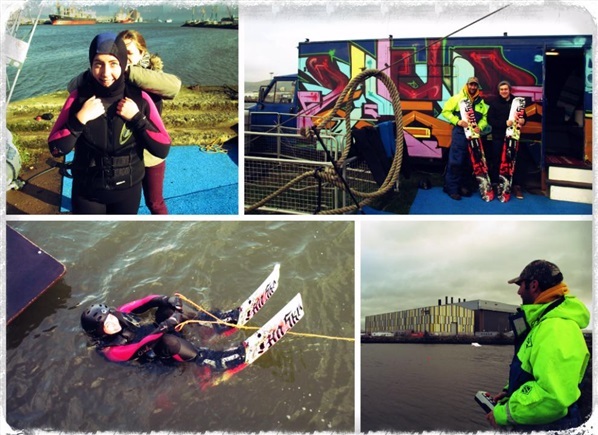 Cable Wakeboarding in Belfast – Have an Urban Adventure! Living in Belfast I always thought any adventures on the water were restricted to a trip to the North Coast, Fermanagh Lakelands or Strangford Lough however with Cable and Wake setting up a wakeboarding site in possibly one of the coolest locations in Belfast, at the end of the famous Titanic Slipway, it turns out you can get your watersports fix right in the heart of the city. When the opportunity came up to head to Cable and Wake I and my colleague Philip jumped at the chance. Keen beans we were ready to become fully fledged wakeboarders and bring back tales of glory of our ‘sick’ moves to the office but secretly we were really thinking are we even going to be able to get up on our skis?! Cable skiing or wakeboarding is a way to water ski or wakeboard, in which the skier's rope and handle are pulled by an electrically-driven cable, instead of a motorboat. 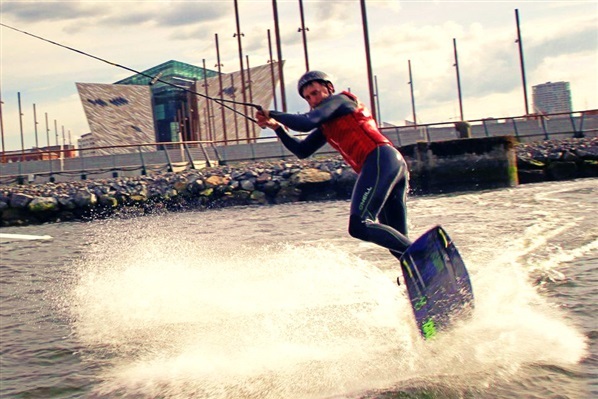 The only site in Northern Ireland Cable and Wake was also home to the inaugural All-Ireland Cable Wakeboarding Championships in 2013. Walking past the iconic Titanic Building we arrived to Cable and Wake’s pimped out trailer at the end of the slipway where Johnny and Samantha proud owners and accomplished wakeboarders were ready to welcome us. Having messed around on the water-skis in my teens I knew it would be fun but wondered how different it would be to being behind a boat. Admittedly it wasn’t the warmest of days however we were soon kitted out in head to toe neoprene which kept us toasty the entire session. Ready to rock Johnny took us through a dry run on land to get to grips with the basics and learn the dos and don’t’s of 'Wakeboarding 101'. A member of the Irish Wakeboard Team it was safe to say we were getting coached by the best. As this was our first time on the cable we both started on water skis to get the feel with the plan of progressing to wakeboarding if we managed to not completely embarrass ourselves! Always the gentleman Philip insisted I should be first to hit the water – a cunning tact so he could watch my inevitable mistakes and make sure he didn’t make them himself. Once in the water the location really came to life with the Titanic Studios, home to the Game of Thrones set, iconic Harland & Wolf Cranes, and Titanic building all surrounding me. Prepared to fall on my face I started making my excuses early in order to set the bar low. Thankfully I was pleasantly surprised (as was Philip!) to find myself up and gliding along the water first time - maybe not quite looking like a pro but up nonetheless. A not so elegant face plant soon brought me back to reality as I came to the end of the line at which point I took a mental note to work on stopping gracefully. A ridiculous smile on my face and with cheers of enthusiasm from the guys on the dock I couldn’t wait to get going again. One great thing about the cable was that since you don’t have to wait for the boat to circle around and get back into position when you purposely stop (otherwise known as falling) a lot more boarding can be fitted into the space of time making it perfect for beginners. Johnny was in control of the cable and was able to bring it back to me so thankfully no frantic swimming was required. Also with no noisy motorboat engines it was easier to hear instruction throughout the session as opposed to the futile shouts of ‘arms straight…ARMS STRAIGHT!’ that normally happen when behind a boat. After a few tips on my technique it was time to get going again. Once my confidence was up Johnny was able to increase the speed of the cable. It wasn’t long before I had an audience from a passing boat tour so hopefully I provided some extra entertainment for them even if this was in the form of them laughing at me! As is the case for most waterskiing or wakeboarding beginner lessons the session lasted fifteen minutes on the water however both Philip and I were pleasantly surprised by what we managed to accomplish in a relatively short space of time with his first go also a success. Although you don’t need a group to book it was great going with someone else as you could watch and take any tips on board for yourself from the docks as well as acting as official photographer. I couldn’t recommend the experience more for anyone wanting to do something completely different in the city or for any water sports fans who don’t have access to a speed boat for a tow. We both can’t wait to get back down to Cable and Wake to progress to the wakeboard. Although 360 flips might elude us for a while the cable really comes into its own for those wanting to get more air to try new tricks and perfect technique. Once changed and saying our goodbyes Samantha and Johnny informed us the bid is on to get cable wakeboarding into the Olympics. 2024 here we come…That should be enough time for us to qualify, right Philip?! Sarah attended the ‘Have a Go’ Cable Wakeboarding at Titanic Slipways. A beginner taster session suitable for all ages from 8 years. No experience needed. Sessions are available to book all year round weather dependent. One on one coaching sessions are also available to wakeboarders wanting to step it up a level and improve their technique. Sessions can be booked for fifteen minutes, 30 minutes or one hour. 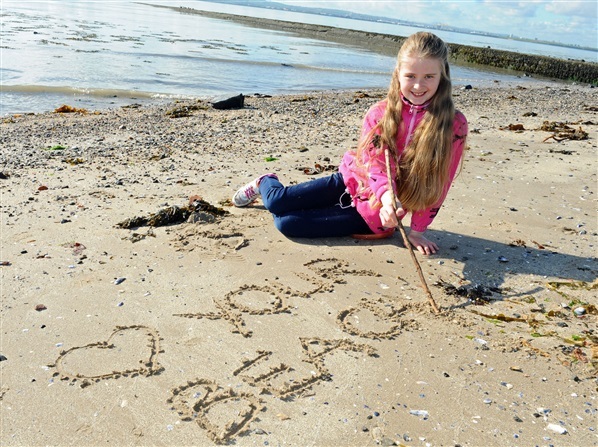 Yes, almost a whopping 800 kilos of litter were collected over 4 days at the beach cleans at Loughshore in Jordanstown, Portstewart Strand, Ballyholme in Bangor and Warrenpoint beach. Almost 300 people joined forces to rid the beaches of waste which, amongst general rubbish such as wrappers and tin cans, this year included a car mat, a For Sale sign, a Christmas bauble, a bullet case, a car headlight and underpants! The four beach cleans, which took place between 24- 27 April, were part of a nationwide campaign tackling litter on 95 UK beaches and 45 canals. The initiative is in partnership with the Marine Conservation Society and the Canal & River Trust, and there have been some fantastic reports from right across the UK. The highlight in NI was the clean-up in Jordanstown which saw over 100 people take part. The volunteers were treated to an M&S BBQ and entertainment from the Cool FM ‘bus’. The fact that the sun was shining was an added bonus! 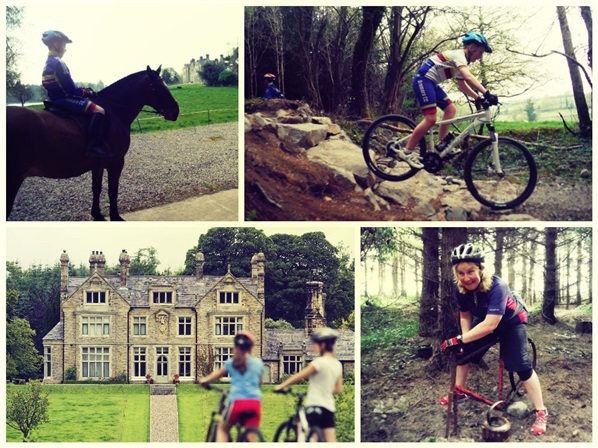 With word spreading not only about the fantastic mountain bike trails on the extended network of routes, but also about the exceptional accommodation on offer, the new PedalStop coffee shop at the trail head (NB limited opening hours), and the wider activities in the beautiful surrounding area Andrea and her family wasted no time in heading to the beautiful Blessingbourne estate for some fun on two wheels, two feet and four legs over the holidays!! Blessingbourne really is a family friendly place, no doubt the reason it appealed to me and so many others over the bank holiday. The new trails provide something for every ability and age of cyclist – given the chicken runs around the new log rides, rock drops, table tops and berms. If you want a tough, technical, fast ride – you’ve got it! If you want a leisurely off-road spin in gorgeous woodland – you’ve also got it! With word quickly spreading about the fanastic trails in such a majestic setting the self catering apartments were heavily booked, as was the new Gate Lodge cottage. Not surprisingly as all accommodation is finished to a high standard and is priced affordably for the quality and location. The new PedalStop coffee shop at the trailhead is a work in progress, with feedback and opinions from cyclists themselves being taken on board currently to make sure the facility provides exactly what is required when the summer holidays come around. Not only can you ride the “Skinny Latte” trail on the MTB network at Blessingbourne, but with the quality Ristretto coffee being used now at the trailhead – riders will be buzzing (literally?!) about the coffee too! Since opening, Blessingbourne’s unique feature has always been its ambience, and immense hospitality from owners Colleen and Nick. They ensure all riders, young and old, feel right at home, and they have a passion for creating a special “getaway from it all” feel. This applies to everybody, regardless of age, cyclist or non-cyclist. If two wheels aren’t your thing, then there are walking trails for two feet, and equestrian trails for 4 legs! Colleen’s gorgeous and charismatic bay horse “Toyboy” can often be seen out around the trails. So whether a day trip, or overnight stay, get down to Blessingbourne – where all sorts of “horseplay” is guaranteed! Gift Vouchers are available to purchase for mountain bike hire including a well derserved traybake and coffee to enjoy after your ride.